If you would like more insight into our 2014 High Speed Internet packages, read the FAQs below. Please contact us if you have any questions or concerns. Q: Why are you changing the Internet packages now? A: Customers have let us know that they want more bandwidth usage options. Online video streaming and gaming is more popular than ever, and as a result, our customers are using more data than ever. The 2014 packages provide more bandwidth usage options than the previous packages. Q: What’s the rate increase for these new Internet packages? A: The monthly price for Internet packages will rise by $1 to $3. 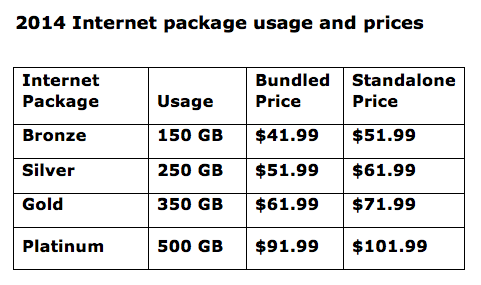 See the table below for Internet package usage and pricing structure. Q: When do the new Internet packages go into effect? A: Your bandwidth usage in February will be billed at existing charges. Starting March 1, enjoy your extra bandwidth in the Silver, Gold, and Platinum packages. Q: In 2013, we had to bundle Internet with another service to qualify for the full bandwidth allowance. Is this changing? A: Yes, the 2014 usage allowances are standard on all packages, whether you bundle service or not. Q: Are there any changes to the Bronze Internet package? A: Yes, we are increasing speeds for Bronze Internet customers from 12 to 15 Mbps. Speeds remain the same on other packages. Q: Which packages will provide increased usage allowances in 2014? A: Silver, Gold, and Platinum have increase bandwidth allowances. Q: What are my options if I want to choose another package? A: If you would like to review your Internet and video package options, or select a package that better suits your needs, please contact us. Q: What will happen to the 25GB data packs? A: Because we have upgraded the usage allowances, we are discontinuing data packs until further notice. We will contact customers with data packs on their accounts and assist them in determining which package best meets their needs. All data packs will be removed from customer accounts on March 1, 2014. If you do not hear from us, we may not have your correct contact information. Please contact us and we will be happy to help you with the transition.